…We have two cats, Hobbes and Brahms (one of them had to be names after a musician!) and a dog, chocolate labrador – Schubert. This is a photo of him, my violin and his favorite pass time – tennis ball: it is on the photo to the right of him. I can’t recall this dog ever going anywhere ( including my in-laws) without a tennis ball. On the days when I have students coming to our house, he knows the drill: the minute he hears a violin or a viola, he grunts and lays down by the student’s instrument case, patiently waiting until the lesson is over and the tennis balls can once again, become the priority not only of his but our lives. 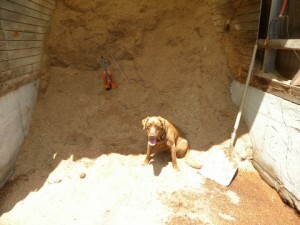 I brought my violin to the barn where my husband was working with horses that day. Of course, Schubert found a tennis from his previous adventures there!